Created to order, these gorgeous retro style prints are created and dispatched within 3-5 working days. "It has been a pleasure doing business with you not only are you fast but that personal touch has been rated second to none, thanks. ...it has exceeded all my expectations and I have recommended you to friends." About your Print: Your artwork will be created to order and printed onto very high quality gloss finish paper stock. The ticket is slightly raised from the background, giving a three-dimensional feel. 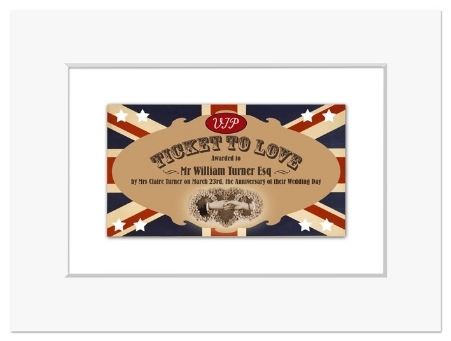 With muted colours and an attractive aged and vintage feel to them, these prints are very eye-catching and make a wonderful keepsake to mark an important moment or event. If you know someone who is a fan of steampunk or Victorian inspired art, they would love to own one of these unique prints too. It will be posted with a backing board, protective front board and a bevel cut mount, and will be smartly presented sealed in a protective clear presentation sleeve. Your print will be posted 1st class in a strong hard backed envelope and will require a signature on delivery. The overall size of the mount is 8"x6" and will fit into any standard 8"x6" picture frame. About the wording: The designs below show featured wording, but you are welcome to amend and replace the wording to suit your occasion. After adding your print to the Shopping Cart, simply use the space provided on the form to supply the wording you would like to appear on your print. (Please double check all spelling!) Have fun with your wording, perhaps giving it an old-fashioned twist - see the samples below to give you some ideas... Each ticket features the words "Awarded to" followed by your chosen name. Thereafter the wording is entirely up to you - just try to keep within approximately 80 characters (spaces and punctuation count as a character). The longer your wording is, the smaller the text will need to be, so try not to make it too long! A lovely romantic present, this would be absolutely perfect for a wedding, anniversary, engagement or Valentine's Day gift. The image on the design features linked male and female hands. This is a great gift idea for a multitude of different occasions: not only for weddings, anniversaries and engagements, but also perfect to celebrate a special moment such as a "welcome to your new home" gift or perhaps to mark a special achievement such as a new job or exam success. The choice is almost endless! The image on this design features three cherubs with musical instruments. A fantastic and unusual gift idea for new parents to celebrate the arrival of their baby! The image on this design features a plump little baby sitting in a baby bath. Looking for a gift to wave "bon voyage" to a loved one? Or perhaps you know someone who has just passed their driving test and you need a gift to mark the moment? (A fun present for a Beatles fan too!) The image on this design features an old-fashioned plane. 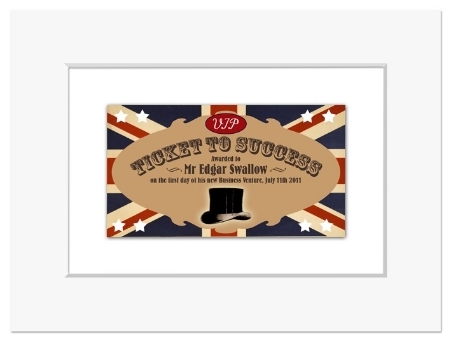 Well, here it is: a ticket to success, with your name on it! What a great present for someone celebrating an exam pass, or perhaps starting a new job. Or a thoughtful present idea for a loved one who is striving to achieve something momentous... The image on this design features a top hat. None of them quite right? 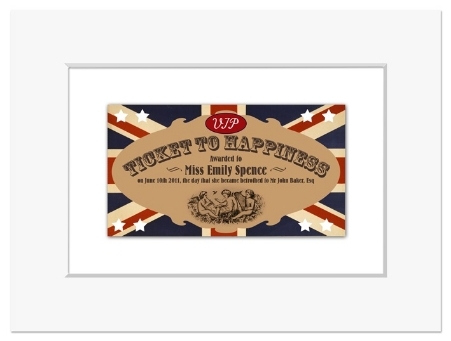 If you have a specific occasion in mind, and the "Ticket to..." wording on the designs shown here isn't quite right, just get in touch and let me know what you're looking for. I'm more than happy to create a custom design for you, although this may incur an additional design fee depending on what you need. Do please contact me to let me know what you would need, and I'll be able to let you know if I can do it for you and whether there will be any additional costs involved.